Midfielder Marzana Fiedtkou at full stretch with Sweeper Ulrica Sutherland in close support. the Guyana versus Trinidad scheduled match had to be postponed until 7:30am on 21st November. In the cool of the early morning, the two familiar sides took the field to determine who would secure the final spot in the women’s semi-final to face either Cuba or hosts Mexico who had both qualified from Group B. 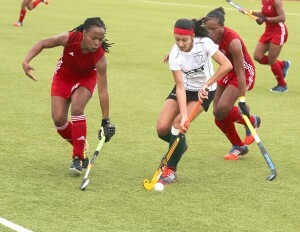 With Trinidad having greater success in previous matches of the competition, the Guyanese needed a win to make the semi-finals while a draw would suffice for the islanders. 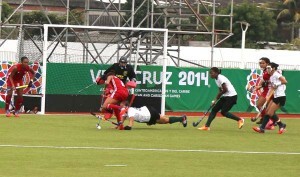 The last time the two teams met on the hockey pitch was one year ago in the PAHF Cup in Mendoza Argentina. Pool rounds results resulted in Guyana and Trinidad having to face each other twice in the competition with Trinidad enjoying victories on both occasions, each by a single goal margin. Samantha Fernandes surrounded by Trinidadian defenders in red. several forays into the Trinidadian scoring circle up the right wing to keep the Guyanese threat alive. With both teams unable to score before the halftime whistle, Guyana would need to press harder for the win in the second half. It was the Trinidadians however who came the closest in the opening ten minutes when a hard cross from the right found Trinidadian Captain, Patricia Wright-Alexis unmarked on the far post. Wright-Alexis however swung her first-time shot wide much to the relief of the Guyanese. Sweeper Ulrica Sutherland was her usual dynamic self throughout the match providing good cover for goalkeeper Xavier with her unmatched speed and fearless tackles. While the Trinidadians held the edge in possession, Guyanese striker Samantha Fernandes excited the morning crowd with her pace and deception, creating a few promising attacks. The clock would have the final say on the match as both teams failed to make a mark on the score sheet ending in a 0-0 draw. It was a tacit victory for the Guyanese as, although they failed to make the semi-finals, they played above expectations and drew with the defending champions who were leaps and bounds ahead of them at the last CAC Games. The result leaves Guyana to face Jamaica today 22nd November at 11:00am for the placements of 5th through 8th. The other teams vying for these spots are Barbados and Bermuda. The semi-finals see hosts Mexico playing the Dominican Republic, while Trinidad go on the face Cuba. The ladies hockey competition of the games concludes tomorrow.